Céad míle fáilte romhat chuig suíomh idirlíon Naíscoil agus Ghaelscoil an tSeanchaí. Is Gaelscoil muid a fhreastalaíonn ar ghasúir agus ar chailíní, 139 páiste a bhí cláraithe sa scoil i Meán Fómhair 2018. Cuireann muid romhainn an caighdeán is airde oideachais a chur ar fáil d’achan pháiste a bhíonn faoinár gcúram agus meas a mhúscailt sna páistí ar ár gcultúr Gaelach féin. 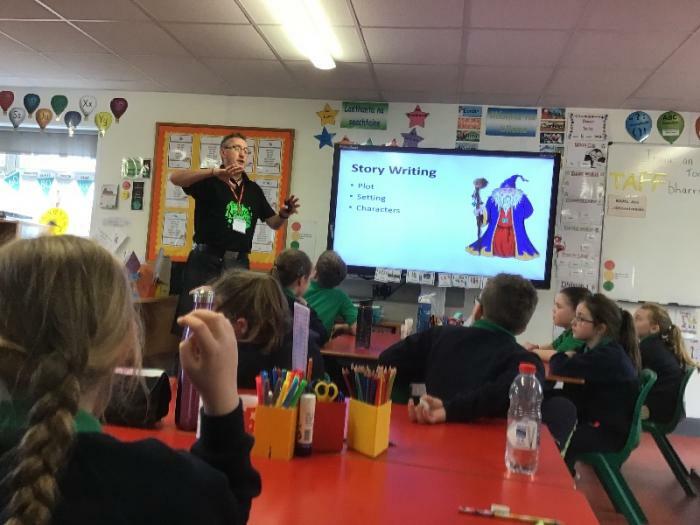 Coinneoidh an suíomh seo tuismitheoirí na scoile ar an eolas faoina bhfuil ag tarlú sa scoil agus beidh sé mar chuidiú fosta ag duine ar bith atá ag smaoineamh ar an ghaelscolaíocht dá bpáiste féin. Bain sult as do chuairt! Gaelscoil an tSeanchaí is a co-educational school providing for the educational needs of boys and girls from Nursery to Rang 7. There were 139 pupils on roll in September 2018. We provide each child in our care with the highest level of education possible and we endeavour to instil in the children a love for our unique national culture. This website will keep our parents informed and will also help any parent who is considering sending their child to a Gaelscoil.